Babies have their teeth start erupting around the age of 3 to 7 months, creating small cuts and blisters in the gums. This, naturally, causes pain and irritation to the baby. Teethers are a great way to give your child when he or she starts getting grumpy because of achy teething gums. Teethers also help young children to learn to hold things with their hands and to correctly place the objects in their mouths. Plus, if you are buying a wooden teether, make sure that the wood is non-splintering. Some teethers are filled with a liquid or gel that can be frozen if placed in the refrigerator. The cold effect can reduce the swollen gums as the redness. Teethers have been deeply tested by several research institutions around the United States as well as Europe. Most of them have been found to contain a chemical that is banned by the FDA to be used in baby bottles, pacifiers and of course teethers. The chemical found is called bisphenol-A, commonly abbreviated as BPA. Other chemicals that have a disrupting effect on the baby’s endocrine system have been found too. When buying a teether, look for a clear label that states BPA-free. Moreover, some teethers also contain parabens and anti-bacterial agents that are called triclosan and triclocarban. 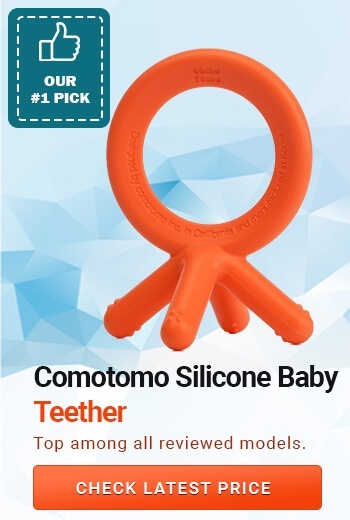 How to Choose a Good Teether? Nuby teether has been extensively examined and tested by various industry experts, including, pediatricians and FDA workers (source). It has been certified as made out of BPA-free soft silicone that can be cleaned in hot water without melting or losing its properties. 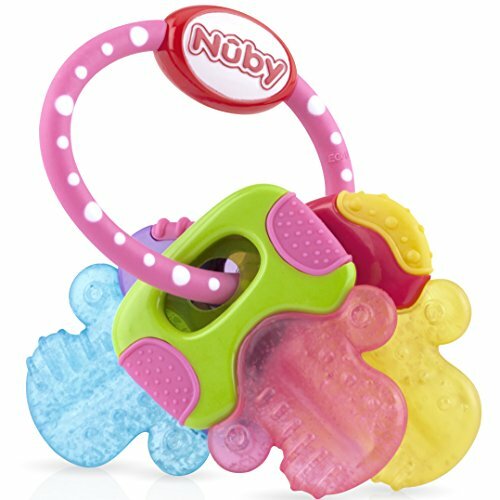 Nuby teether has a nice, different texture that helps ease irritated gums of your little one during the teething process. The soft, silicone bristles help massage the gums aiding in the eruption of new teeth, plus, it adds a new sensation in the mouth of your baby helping him recognize different surfaces of the teether. Moreover, the teether can be placed in a fridge for a little while; the added cold will help reduce the redness of the gums as well as numb the annoying pain helping your child feel better and calmer. Some mothers have reported using this teether before bedtime to help aid better sleep. Furthermore, the teether is designed in a fun fish figure that will surely entertain your little one. It is made in an optimal size that will fit even the smallest of babies’ mouths without tiring the muscles. The manufacturer has added a transparent, portable carrying case in the package to make sure the teether stays clean and that you will always have on hand to give to your baby as soon as he starts getting grumpy. Munchkin brand was designed by several mothers in Ohio. They aimed to create a universal teether that could easily double as a toy. After conducting surveys with new mothers in their local neighborhood, they have come to realize that most babies get tired of using the same teether for a long time. They also realized that that percentage almost doubled if the teether was made of one color and texture. It was no surprise, though, because young babies have a very short attention span. 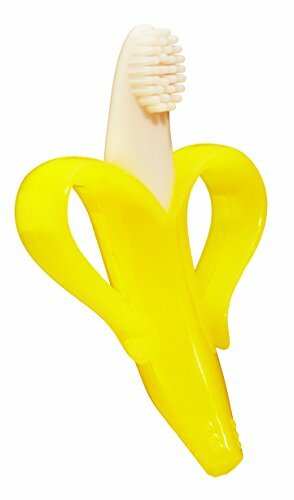 Fast-forward, the teether market now has this colorful, twisted teether that is 100% made from safe materials. Plus, it is made to have not one, but four, different textures and can be used as a toy for older kids too. 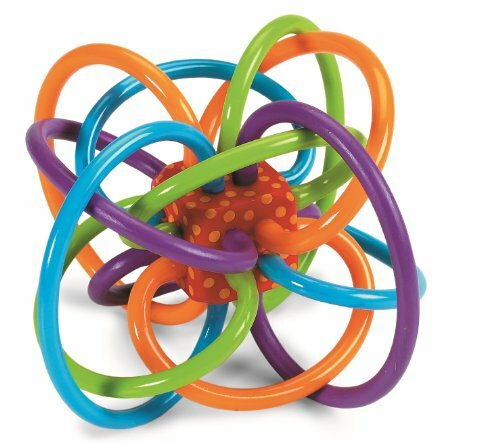 Moreover, the Munchkin twisted teether helps to develop their motoric skills. 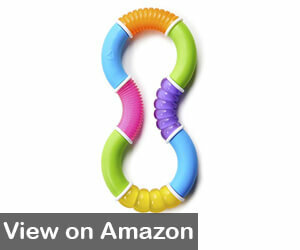 This teether is suitable to be used by children that are 3 months and older. For cleaning purposes, it is advised to place in a bowl with warm water and mild soap or baking soda. Sadly, this teether is not microwave or dishwasher safe. For old, stubborn food leftovers on the teether, you could use a toothbrush to gently rub the dirty surface. Lastly, you can place this teether in the fridge to cool it before giving it to your baby but do no place it in the freezer as this can damage it. Bright stars manufacture these teethers in a pack of 3, each having its own color and design. They are made using an ecologically clean plastic that is safe for your child and the environment. Plus, they are easily cleaned using warm water and mild soap or vinegar. They are filled with water and can be kept in the fridge until needed. The cold teethers help ease gum inflammation and provide a sense of comfort to the baby in the difficult period of teething. They are reported to be made in the perfect size for little hands to hold and each teether has its own texture that doubles as a massager. 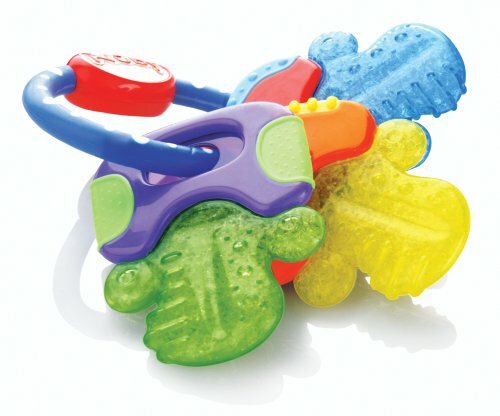 The pack contains yellow, blue and green teether with each one made out of a different texture. They are filled with water inside. Unfortunately, you can’t boil or microwave these teethers as they will simply melt and leak. You can carry several with you in the diaper bag, and if your baby drops one to the floor, you will always have a spare to give him. Razbaby is a great option for mothers looking for a hands-free teether that has soft and hard textures in one teether. The silicone used in the production of this teether is PBA-free and does not contain any parabens or other toxic chemicals. It can also double as a pacifier for babies that are, sadly, addicted to one. 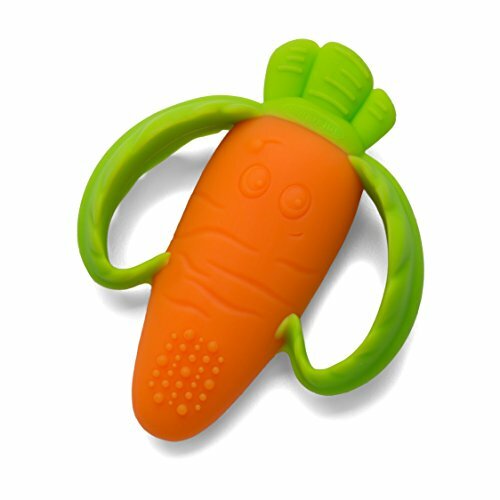 This teether is suitable to be given to babies as young as 2 months old and can be placed in the fridge for cooling. Like the teethers above, this Razbaby teether cannot be microwaved or tossed in the dishwasher because the silicone used in the production will not stand the heat. Instead, clean with warm water and mild soap only (source). This teether is made out of food-grade silicone and can be sterilized using boiling water as well as microwaves and the dishwasher. It is made in two colors, orange and blue, and has multiple holding points that can prevent babies from choking on it. It is best given to babies that are older than 4 months because the long tails can harm the nose if inserted or the eyes. Also Read: Best Baby Nasal Aspirators – Help Your Little One Breath Better! This teether comes with a handy carrying case so that you can always have a teether on hand to give your little one. It is made from safe plastic that does not contain any chemicals. The different textures on the teether massage the gums and release gum pressure that occurs as a result of the teething process. The teether is filled with water, and though this will help in cooling the painful gums, it makes the teether not suitable to be placed in the freezer because the water will turn to ice. Consequently, the expanding ice will crack the shell of the teether. To clean and sterilize it, take a bowl with warm water and add a few spoons of hydrogen peroxide to it. Place the teether for several hours in the solution then rinse and dry. For daily cleaning, you could also wash it with mild soap under the running water. 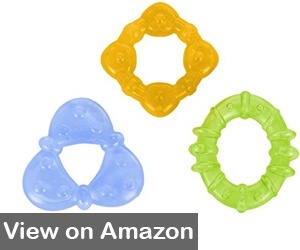 This teether has been designed to cool painful gums during the teething process without any cooling liquid. The safe plastic that is used in the production stays cool for some time without there being any liquid or gel in inside. This ensures that there are no leaks even if your baby chews the toy open. Moreover, its watermelon piece design ensures that the teether reaches all areas of babies’ mouth. Mothers have reported it to be a perfect teether for front and back teeth. 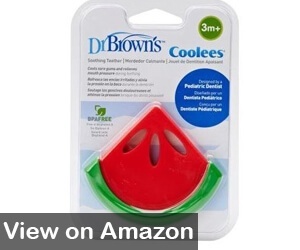 You can give Dr.Brown watermelon teether to children as young as 3 months, and you can place it in the freezer overnight without worrying that it will get ruined. Plus, the teether is painted using only natural colorants that derived from fruits and vegetables. Furthermore, it does not contain the common harmful chemicals, such as BPA, parabens, PVC, and polymers. Clean it using a damp cloth or children’s wet wipes, for a more aggressive method, use a toothbrush soaked in mild soap. Do not use white vinegar or rubbing alcohol because they will discolor the teether. Lastly, don’t place the teether in the microwave or the dishwasher. The heat waves might disfigure the teether. When shopping for baby teether look for the ones that have been tested and certified as BPA-free. Plus, pick a baby teether that will be easily handled by your baby and one that has several textured surfaces on it to meet your babies’ quick changing interest. Moreover, choose a teether that can easily be cleaned and sterilized in hot water, microwave or even the dishwasher. Also, look for a teether that is made out of strong material so that you don’t risk it being broken or cracked during use. 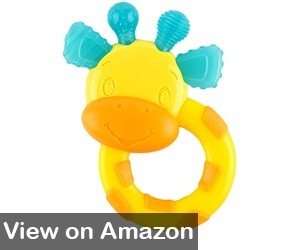 Lastly, pick a teether that can double as a toy such as keys teethers, animals or rattles. As mentioned above teethers can help young parents reduce the painful symptoms of teething. However, after the teether spends sometime in the mouth of your little one and has fallen several times to the ground it will need a thorough cleaning and sanitizing ritual to take place. Erupting gums lose their protective ability because they are constantly bleeding and the opening where the teeth are growing can be attacked by a number of bacteria and viruses that get straight into the bloodstream. Moreover, we adults, have a much better and much stronger immune system that our little ones have yet to develop. Pediatricians strongly suggest thoroughly sterilizing teethers after each use until your baby turns at least 6 months of age. Afterward, provided that your baby has no problems with the immune system you can cut back on cleaning and sterilizing because his immune system is now strong enough to withstand mild bacteria, germs, and viruses. The first step would be to examine the teether and read the instructions on the packaging as most manufacturers clearly state what you can and cannot do to sterilize the teether. Some teethers can be sanitized using hot or boiling water and others can be cleaned in the microwave or the dishwasher on regular cycles. If the teether cannot be sterilized using hot methods then wash it under the running water, use cleaning brushes to remove any hardened food residue or milk formula. Then place the teether in a bowl with clean water and white vinegar. Let the teether soak for a while then rinse well and dry it. Just remember to not boil the teether under any circumstances because liquid-filled teethers can easily leak. In conclusion, we hope this list of affordable teethers will simplify your shopping experience. Moreover, we hope that the teether itself will relieve your child of the impending pain and hassle of erupting teeth. However, no matter how hard the process might be, remember that your child is growing and is getting one step closer to being older. With new teeth comes an array of new experiences and possibilities because now you will be able to feed your baby new food ingredients, soaps, and purees. Your little one will be able to chew, and most importantly, taste so many new meals. He or she will start developing their own food preferences that will eventually become part of their personality and character. Lastly, if your baby starts getting too grumpy because of teething, consider visiting a doctor if possible. If not, keep mild child painkillers and fever medication on hand at all times. TemperAndTantrum.com is a participant in the Amazon Services LLC Associates Program, an affiliate advertising program designed to provide a means for sites to earn advertising fees by advertising and linking to Amazon.com; Amazon and the Amazon logo are trademarks of Amazon.com, Inc. or its affiliates. All information found on TemperAndTantrum.com is intended for informational and educational purposes only. The information provided on this website is not intended to be a replacement or substitute for professional medical advice. COPYRIGHT © 2019 · TEMPERANDTANTRUM.COM, ALL RIGHTS RESERVED.